Louisiana piano player/songwriter David Egan is better known for his work with Filé and Lil' Band of Gold. 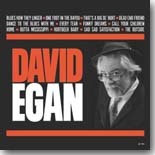 But his self-titled solo release, this month's Pick Hit, shows that Egan is an artist who's got the chops to stand on his own. Australian artist Kara Grainger is ready to take the United States blues scene by storm, as evidenced by her new CD, Shiver and Sigh, our Surprise pick this month. Ace Records has re-released the 1987 classic Lazy Lester Rides Again, from Louisiana legend Lazy Lester. It's our Flashback feature for July. Our What's New section features reviews of new CDs from The Slide Brothers, Trampled Under Foot, Too Slim and the Tail Draggers, Bart Walker, The Soul of John Black, Kirsten Thien, Austin Young, Emanuele Fizzotti, Pam Taylor, Frank Bang, and more.